Toronto’s summer vacation season can be an exceptional time to travel, but as British Columbia resident Kenzie Markey’s recent tragic saga of injuries in a U.S. skydiving accident illustrates, an ideal time also for reviewing the importance and intricacies of comprehensive travel insurance coverage. Markey’s current situation could be so much worse. The 32-year-old from Squamish was left with a collapsed lung and fractures to her femur, foot, pelvis, skull, eye socket, nose and elbow last month when her parachute collapsed in mid-air during a routine jump in Phoenix, Arizona. Now in recovering in stable condition, Markey faces medical bills that will exceed $500,000 because her TD Insurance travel coverage explicitly does not cover “hazardous activities,” including most extreme sports. Transportation back to Vancouver alone will likely cost her and her family an estimated $30,000. Her loved ones launched an online campaign to assist with her bills that garnered over $13,000 in donations in its first week. It’s unfortunate that such a valuable lesson must come at the cost of such debilitating injuries. That said, there couldn’t be a more valuable time to paint the importance of carefully reading through every travel insurance policy’s details. THE PRICE IS RIGHT….IS THE COVERAGE? From the outset, never lie, embellish, manipulate or otherwise distort your medical history when applying for travel insurance coverage. Toronto’s courts can and will side with an insurers taken to court after denying policy-holders’ claims based on inaccurate, misleading and sometimes even deliberately fraudulent applications. This becomes particularly important when detailing preexisting conditions. Take nothing for granted and disclose everything. If in doubt, consult your physician before submitting your policy application. You may not think a condition would be particularly important, but especially for applications 60 years and up that will probably fill out especially thorough health forms, it’s better to disclose and be denied than to mislead/embellish and have a claim rejected later after the bills have arrived. As illustrated by Markey’s case, understand your coverage completely and know for certain that it meets your trip’s needs. Many policies won’t coverage reckless behaviour while intoxicated or certain dangerous sports. Most won’t foot the bill for non-emergency care or routine checkups. Finally, once you’re on your trip, always keep your policy documents handy. These should include your policy number, emergency contact information, and any other travel documents. Also, frequent travelers should remember that buying annual travel coverage can cut costs considerably. 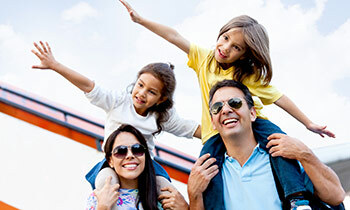 Often, $30 to $40 can purchase a week of reasonable medical travel insurance. If you have further questions, please contact Blue Umbrella Financial Services today. Your first consultation is always free, and our brokers will work with you to decide what kind of coverage will best protect you until your safe return to Toronto.